You long to have closeness in your relationship and you may know empathy is a key factor. But, you don’t know how to fix the lack of empathy in relationships. 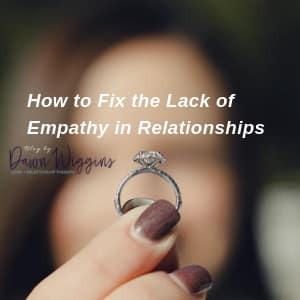 I am going to teach you 4 steps to repeat over and over again until you master empathy in your relationships! Can you imagine living your life without access to a cellular signal or an internet connection? I sometimes fantasize about it, LOL. But, my guess is no. You may remember a time before these things, but by now you are quite used to them and perhaps even rely on them daily. Because of this, I am going to use it to teach you how to fix the lack of empathy in relationships. Wifi and cellular is the technology that allows us to be digitally connected. This digital connection keeps us in touch with our Amazon cart, friends, family and, favorite music and TV shows. Now picture your life without it. NONE of it. I’m pretty sure you wouldn’t know what to do with your hands. And, you would feel disconnected and struggling to stay regularly connected with your important people. Empathy works much the same way. It facilitates the connection between human hearts and minds. Let’s not confuse empathy with sympathy. To clarify the difference between the two, imagine you were talking with a friend and learned they still used dial-up internet. It’s pathetic right?! You can’t imagine (said with dramatic flair) dealing with such prehistoric tech. I mean, who has time for that?! That pittying, judgy response you have to dial-up is the same thing as sympathy. Sure, you feel sorry for the guy, but you also don’t want anything to do with his mess. It sees others as somewhat pathetic for their struggle. The action of empathy treats others as loving, worthy beings to whom you wish to be close. You don’t get it, it’s too confusing. You may follow folks like Brene Brown who talk about empathy. But, you don’t know how to do it in your daily life. I’m going to break it down for you in steps. You like steps right? Easy to follow and practice. While in conversation, listen *closely to the person speaking. If, they have not explicitly stated how they are feeling (mad, sad, glad, afraid, mortified) ask. If they have clearly stated how they are feeling, take note. Think about a time you have felt the same feeling. NOT the same story, the same feeling. This is called relating. Relating is the key to empathy. Notice what you wanted or needed that time you felt mad, sad, glad, afraid or mortified. Once you figure out what you wanted, offer it to the other person. Repeat all steps until you both feel close or connected with each other. Because without it we are disconnected, and our relationships suffer. When my husband tries to fix my problems without understanding where I am coming from, I escalate, and things get ugly. This is because he has skipped one or (most likely all) of the four steps. And, I am very clear that the first 47 times you practice steps 1-4 you will probably have a contorted possessed look on your face as you try to maneuver through the process. I can’t really solve that part for you. Just like you weren’t always a pro at speaking in complete sentences (cue ages 0-5) this too may take quite a bit of practice. No worries, once you’ve logged your hours, it will be as life-changing as learning how to communicate. Keep in mind, that not every being is in a space to give and receive empathy. Just like not every device maintains a stable connection all of the time. There will be times in life you will come across wholly disconnected humans. You don’t need to spend your empathy superpower trying to force a connection. Sometimes you need to accept there is a 404 error and move on.